I read this article and found it very interesting, thought it might be something for you. The article is called Chocolate Covered Strawberries for Party and is located at http://eugeniekitchen.com/chocolate-covered-strawberries/. Melt chocolates in microwave for 1 minute first. Then stir until homogeneously mixed. My white chocolate melted faster than dark chocolate. Then place into hot water, not boiling water. Now I microwave dark chocolate for 30 seconds more. Okay. Meanwhile, line a parchment pepper on a sheet pan. 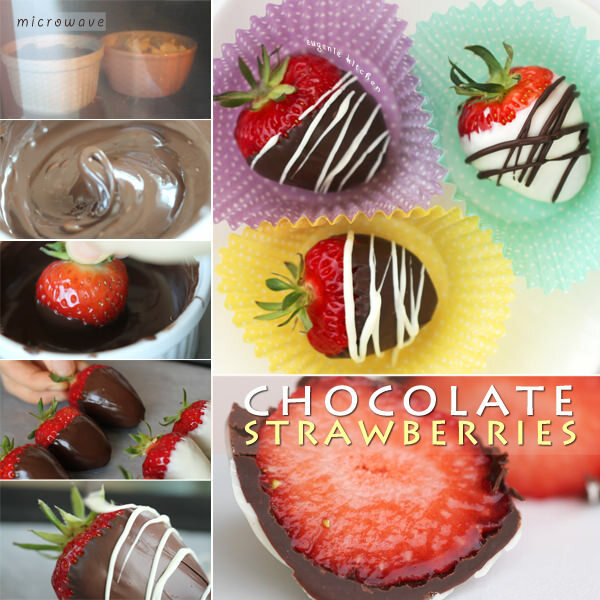 Dip a strawberry into chocolate and set on the parchment paper. Repeat with the rest of fruits. Dip a fork in chocolate and drizzle over the strawberries. Or use a narrow pastry tip if you want. Today I am using cupcake liners to serve. Voila. Chocolate covered strawberries. They are beautiful, are they? This is a fresh strawberry. Bon appetit! I love it.